I’m usually pretty good on Mondays. I usually (using the operative word again) decide on Sunday what clothes to wear on Monday. Today was chaotic for me. I opted for black trousers and then further slid away the closet door to find a navy blue lacy top. I paired the top with a black singlet to keep me covered. A black belt to cut the top from the bottom. I removed the grey jacket from the hanger and decided that this will do. Whilst I was walking out, I realised I needed a little bit of ‘something’ to give my attire an ‘umph!’So I went back to my room and went straight to my box of scarves. 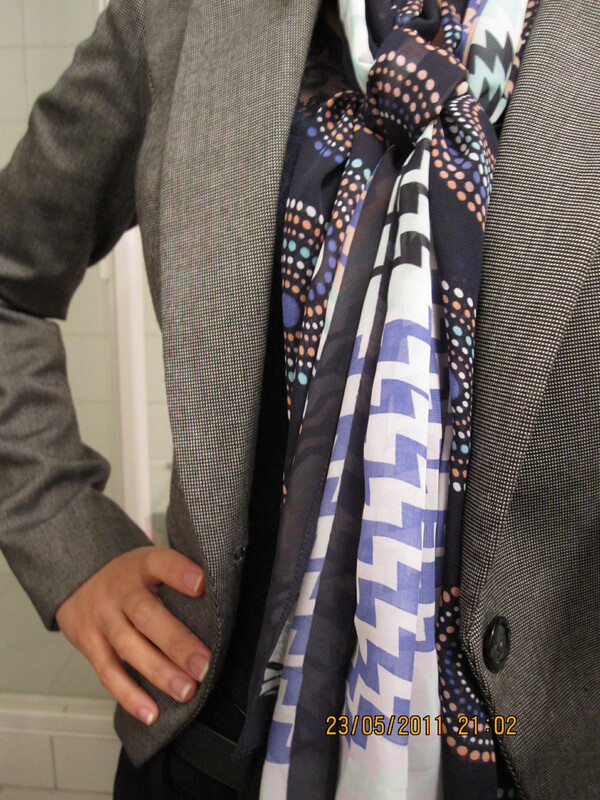 At first I decided a patterned silk scarf. It didn’t feel right. 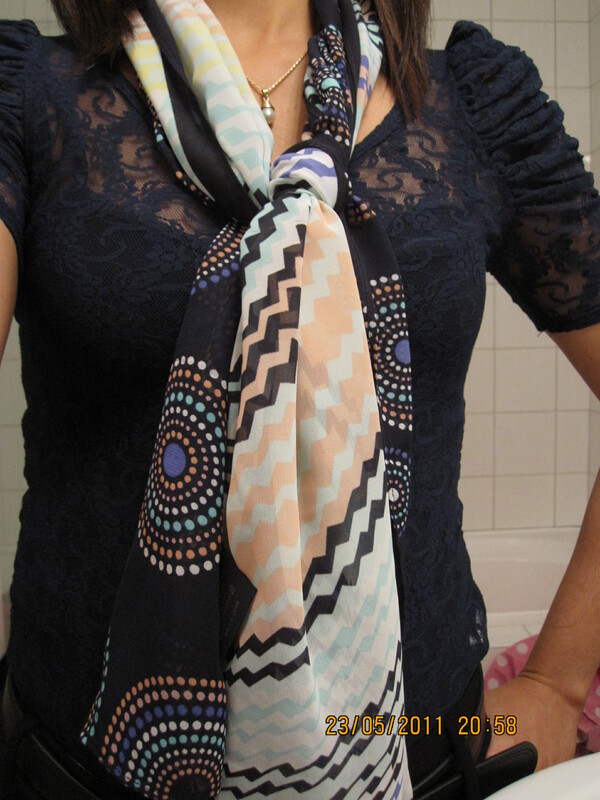 I thought that the texture of the scarf clashed the lace design of the top. I then remembered my two Witchery thin scarves. I pulled the first scarf that is dark blue but with pointillism design. Not being content with this scarf, I pulled the other scarf with a pastel zigzag pattern. My husband was already waiting for me outside as I heard the car engine running. I took both and thought to myself that I will just decide inside the car, on my way to work. I put both scarves around my neck and simply did a one lose knot of both. Somehow this could work. As soon as I got inside the car, I unfolded the sun visor and flipped open the small mirror to check the scarves. Which one to keep? Which one to leave? Surprise! I ended up using two different scarves. I said to myself, “Let’s clash these two patterns together to get a good mix’. Scarves are good accessories especially when wearing a one-colour look. Since I was wearing too dark a colour (black and navy blue) adding patterned scarves lifted the outfit to a different look. Please see the photos of my ensemble today.